1. Roll a Groundhog  supply dice. Student roll and draw the shapes provided. First to draw a groundhog head wins. 2. Groundhog Day Findings  Students cut out a groundhog and glue it to a stick. Teacher provides a flashlight and breaks students into partners. Partners complete the Groundhog Findings sheet. Includes printables to make the glyph, glyph key, and a center data sheet to complete once the glyphs are displayed. a book for your students to fill in on Groundhog Day. Groundhog for your students to color and cut out. Includes a Groundhog Activity Sheet for students to fill out. Display the worksheet with the Groundhog. Board game and sight words to play with on Groundhog Day. 9 Groundhog Data Collection sheet. 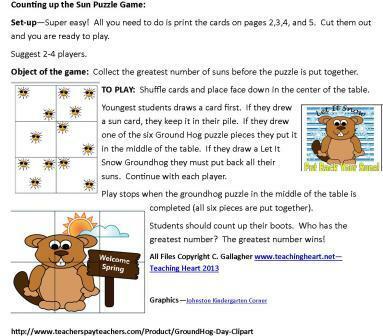 Perfect game for your students to play in groups on Ground Hog Day! With 1 dice or two! 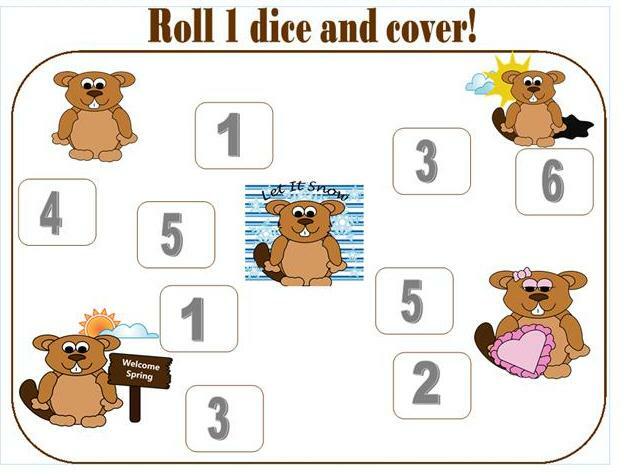 Over 15 Pages of Groundhog Activities for K-2! 8.99  Less than 1.00 a file!!! After payment you will get an instant download and can begin using the packet today. Note: Trust Teaching Heart we use our own graphics or graphics with permission. No need to worry about copyright issues! Selling printables to 1,000's of happy teachers since 2002! How cute are these from the packet?? ?